Book of Hours of the Roman use, in Latin. 15th-century manuscript on vellum, probably written in France. Some 17th-century Dutch marginalia. Bound in modern stamped calf. Books of Hours were prayer books used by the laity for private devotions. Already popular at the end of the 14th century, they were produced in vast numbers in the 15th century, particularly in France and in the Low Countries. The books contained a calendar of Saints' feasts (the names differed with the locality for which the particular Book of Hours was intended); a selection of one or more quotations from the Gospels; prayers to the Blessed Virgin; an Office, usually to the Virgin, which was divided into the nine canonical hours whence the book took its name; the Seven Penitential Psalms; the Office for the Dead; and a selection of private prayers. The Hours themselves were often illustrated richly. Pictures of the Nativity and the Passion were most popular, (usually these were attached to the Offices of the Virgin and the Holy Cross), and often the calendar was illustrated with a scene associated with the month in question. Thus there was a conscious attempt to make each Book of Hours rich and ornate, as it was in demand as an oeuvre no less than as a devotional prayer book. 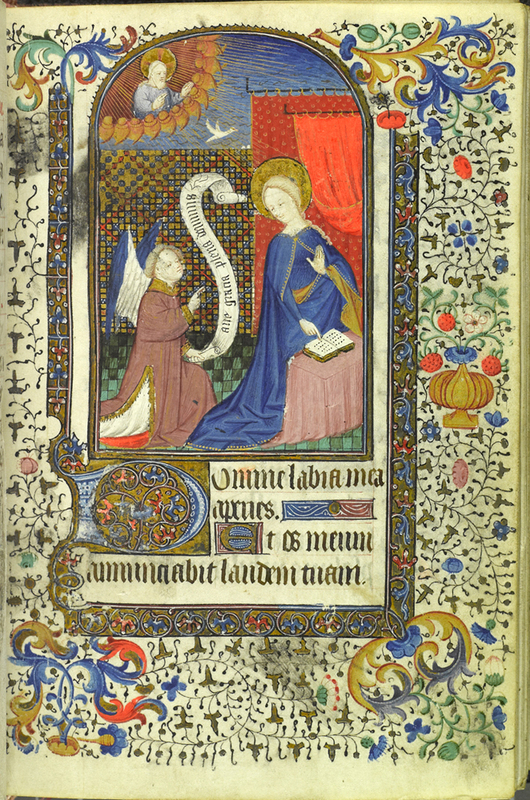 Acquired by Lehigh in 1959, the gift of Mr. Robert B. Honeyman, Jr.
Book of Hours of Paris use, in Latin. 15th-century manuscript on vellum, probably written in France. Bound in 18th-century tooled black Moroccan. 4 miniatures. The miniature exhibited here depicts the Annunciation- the Angel Gabriel appears to the Virgin to inform her of her conception of Christ. The scroll in the picture reads: Hail, full of grace, the Lord (is with thee), and the image shows the exact moment in which Christ was conceived. According to some medieval theories, Mary literally conceived through her ear, and she is often represented as half-turned towards the angel. In some miniatures, in fact, the scroll is shown running from the angel's lips to Mary's ear; here the Holy Spirit is represented as dove. The sacredness of the scene is further enhanced by the drawn curtains, connoting either the temple or a marriage bed. The book that Mary touches further illustrates the sacredness by referencing the fulfillment of the promise under the Old Law, which God made through his prophets. Acquired by Lehigh in 1881. Book of Hours of the Roman use, in Latin. 15th-century manuscript on vellum, written in France. Bound in modern red velvet. 13 large and 5 small miniatures. 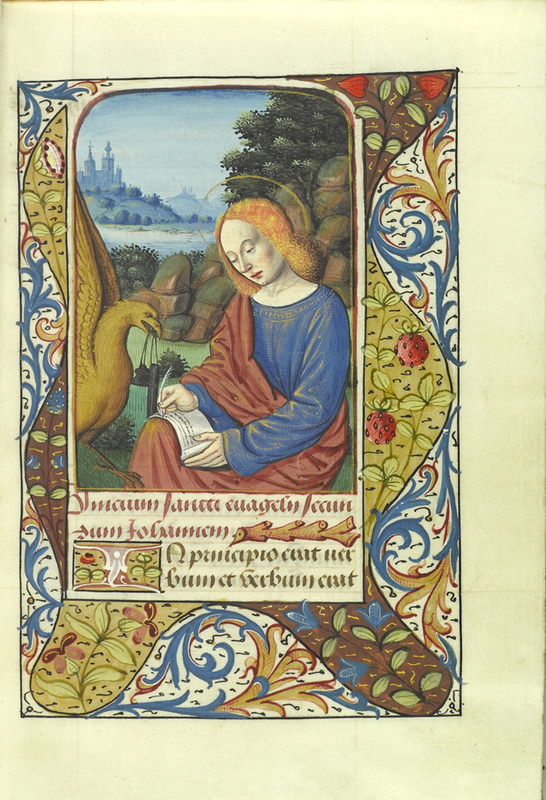 The miniature exhibited from this manuscript shows St. John the Evangelist in the act of writing. The water in the background suggests that he may be on the island of Patmos, where it was thought that he composed the Book of Revelations. Beside him is his symbol, the eagle, holding an anachronistic 15th-century ink stand. The eagle was associated with John because of the soaring quality of his gospel, particularly in the prologue. Book of Hours of the Roman use, in Latin. 15th-century manuscript on vellum, written in France. Bound in modern stamped calf. Border of front folio illuminated. 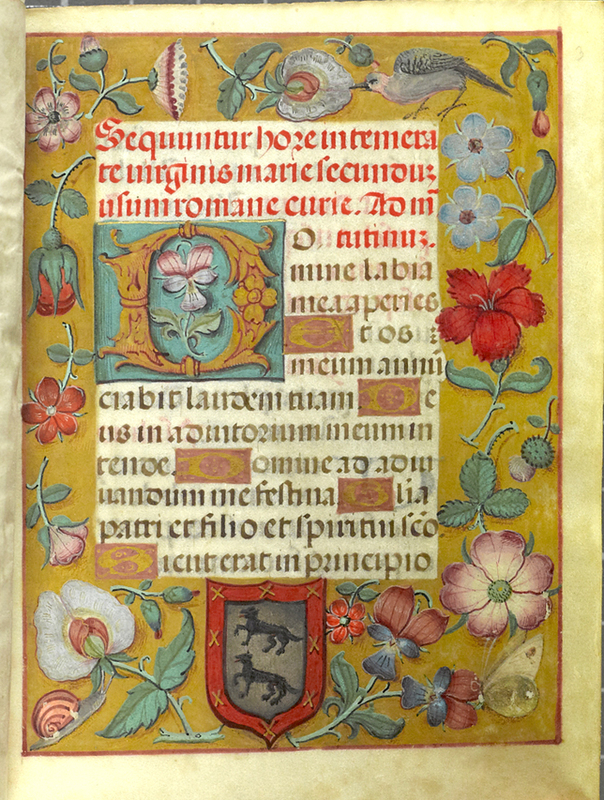 The border-decoration exhibited from this manuscript differs markedly from the calligraphic spiral decorations, mixed with naturalistic and other floral patterns, which may be observed in the other Books of Hours exhibited here. In this manuscript the border-zone is treated as an area in itself, in a way that would become popular in the Ghent-Bruges school of painting, following such exemplars as those supplied by the Master of Mary of Burgundy in the late 15th century. 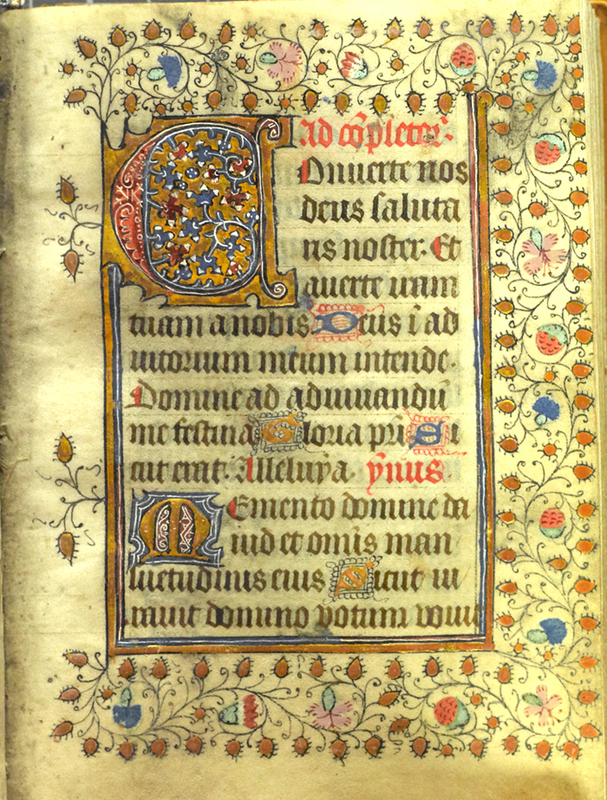 Book of Hours of the Roman use, in Latin. 15th-century manuscript on vellum, written in France. Bound in modern boards and tooled calf. 5 miniatures. 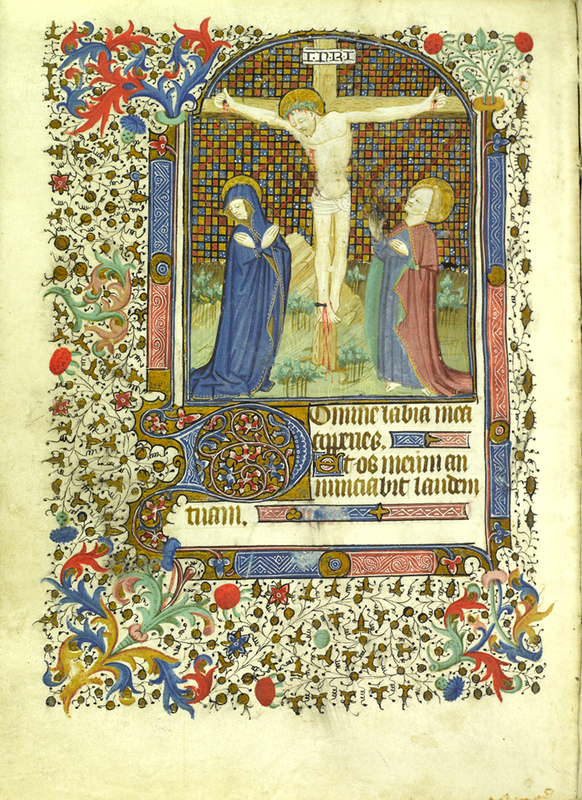 The crucifixion scene exhibited from this manuscript begins the Hours of the Cross and shows Mary and St. John in affective poses under the crucified Christ.